A million points of light, tiny drops of condensed fog, clinging to branches and brilliantly illuminated in the morning sun. This is another image in the “not what I set out to photograph” category, having arrived at the Sataf Nature Reserve several days too early to catch these trees in bloom. But I’d also place this photo in the school of “finding a new way to represent a familiar subject,” as these almond trees are absolutely radiant in their flowerless, buds-about-to-burst-open phase. Close to my home and refreshingly diverse, my frequent visits to this park continue to yield wall-worthy photographs time and again. You really have to enlarge the top image to appreciate how the sun and moisture combine to transform a few ordinary trees into a dazzling, evanescent light show. (And if you’re looking at it on a phone, well, I guess I apologize). Composing the image was easy as the stairs create a natural pathway into the photo. I only needed to climb high enough to where there are enough trees to fill both sides of the image and I could point my camera downhill, tilted away from a direct angle at the sun. 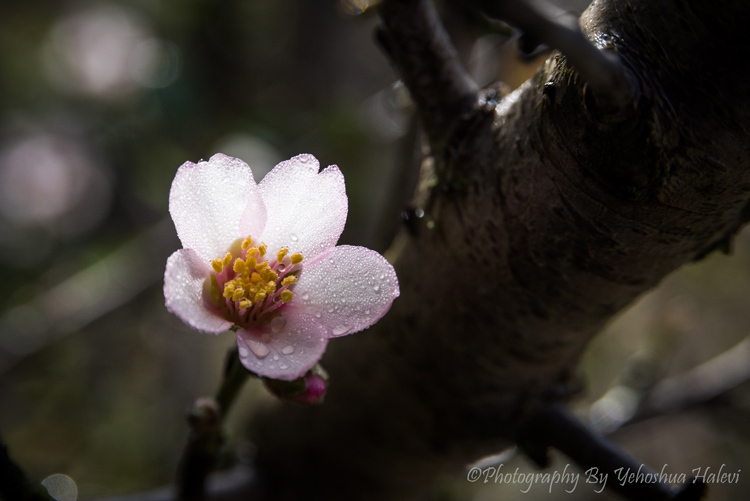 The lower photo features a single almond blossom I discovered later in the morning in the upper section of the reserve. Still wet with dew and softly lit by diffuse light bouncing around inside the tree’s crown, this blossom heralds the arrival of yet another season of rebirth. Join our sunrise to sunset guided tour and photography workshop in Israel’s “Big Crater” on Sunday, Feb. 21. For details, click here.